The Great Albini Slots is a 25 payline, 3x5 slot game by Microgaming studio Foxium. This master magician and his beautiful sidekick Lily are ready to show you magic and wonder with every spin. This conjurer has plenty of tricks up his sleeves including free spins, substituting wilds and mystery boxes. The immersion of this slot is exceptional. You will feel as if you are part of the show thanks to the spine-tingling soundtrack and the crisp 3D visuals. When the Great Albini starts twirling his cane, hold your breath: you could be in for an enchanting surprise! Especially considering you have the chance to win 5000 coins on every spin. The free spins bonus is without a doubt the most magical part of this slot. And you can activate the bonus in one of two ways. You can either wait for Albini to award it at random during base gameplay. Or: you can buy one of three free spins rewards via the bonus box. Regardless of which way you activate your spins, you will play on a new reel set. This reel set now features 50 paylines - which is double than the base game reels. And there's a good reason for this. As you spin, there's a chance the magician could perform one of his best tricks. And for this, he will need his lovely assistant to take centre stage on the reels. With a flick of his wand, the Lily feature will activate - adding a giant reel wild to one of the three central reels. But that's not all: the Lily wild will also multiply all wins by 2x their value. And as an added bonus, the reels will keep spinning as long as you keep winning. In the event of a losing spin, the feature will stop and Lily will return to the side of the game. Tired of waiting for the free spins? Skip the queue and buy your way into the bonus - complete with the Lily wild feature. 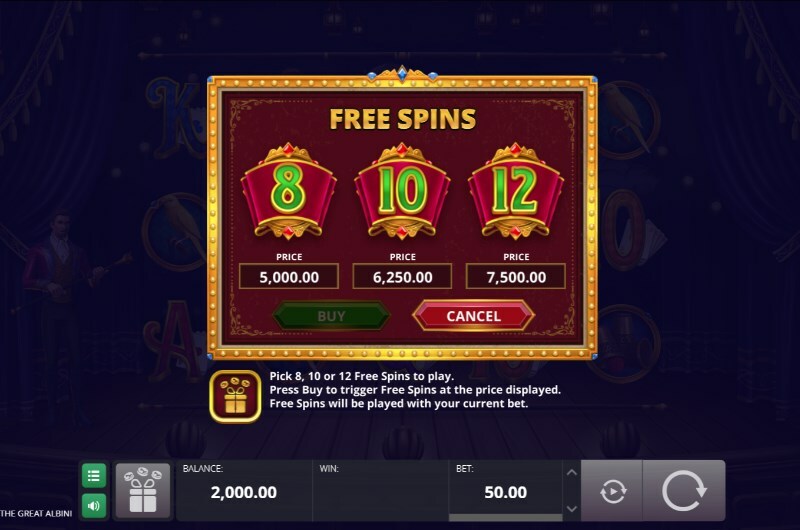 You will get three choices of free spins: 8, 10 or 12. Each of the rewards costs a certain amount of coins. For example, buying 8 free spins will cost you 100x the total stake bet. While buying 12 free spins will cost 150 times your total staked bet. It's a fantastic way to jump into the free spins early without needing to wait. The Great Albini has some neat tricks in the base game too. On any random spin, the magician can create a central column of mystery boxes. This will activate the Mystery Box respin feature. During the feature, all other symbols will be removed from the reels except the game logo and the mystery box. The slot will then begin to respin the other game segments. The objective here is to get as many mystery boxes as possible. The feature ends when three non-win spins occur in a row - or the reels are filled with boxes. After either scenario takes place, every box will reveal the same symbol. 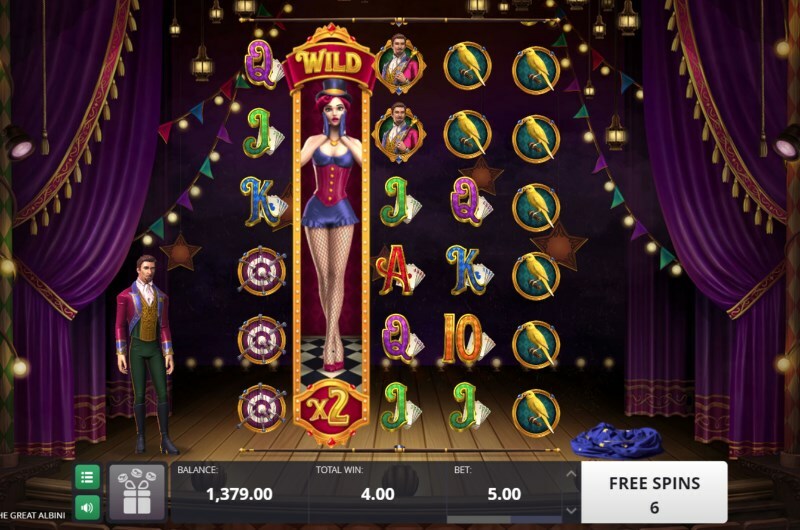 Every symbol in the game could be shown - minus the free spins and scatter. Not finished with the magic just yet? There is also a range of achievements you can shoot for. This includes getting a symbol win a certain amount of times - or activating one of the main game features. Players can expect a 96.66% return to play on the Great Albini slot game. And this is slightly higher than other rival Microgaming slots. In terms of variance, this is a medium volatility slot - which should prove appealing to inexperienced and more seasoned players. In a medium variance slot, wins are frequent - with big wins being more uncommon. This makes the slot a good match for many types of gamblers. The prize potential for this slot is impressive - considering you can win up to 4000x your total staked bet. The two highest paying symbols in the game are the Great Albini himself and Lily, who can pay 1000x and 500x respectively for a five of a kind match. One of the best winning opportunities is the Mystery Box respins, which can fill the reels with either of these symbols. If you're looking for the greatest show on earth then look no further. 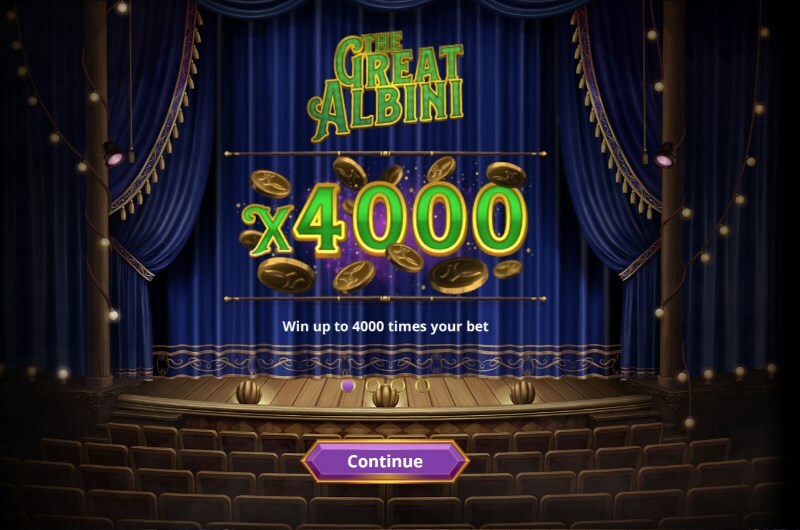 The Great Albini slots is sure to mesmerise you with many slot features and fantastic presentation. This is one of the best magic themed slots we have played in a while. We recommend stepping up to the stage to experience some magical fun. Play it now right here at Pots of Gold Casino.